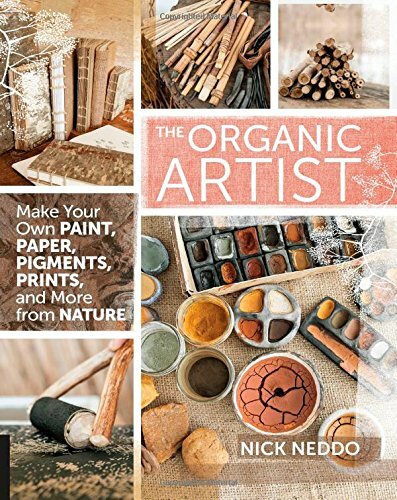 The Organic Artist is a very hands-on book for artist who enjoy the process of making their own drawing tools. It is only after going through the book that I gained a new profound sense of appreciation at the convenience of being able to buy drawing materials online or from shops. And also how much effort it takes if you want to make your own drawing tools. The book covers the making of charcoal, pens, inks, inkwells, paint dishes, paintbrushes, pigments and paint, crayons, paper, printmaking blocks, sketchbooks and journals. That's more than I expected in this 160-page paperback. There are step-by-step instructions and photos provided that you can follow along to make your drawing tools. You'll learn how to make your own drawing charcoal stick complete with holders by cooking the sticks in tin cans, source for bamboo or quill to make your own dip pen, grind rocks into pigments, make ink with walnuts or rusty nails and vinegar, make hide glue from animal skin, how to fire clay and and many more. Also mentioned are pitfalls to avoid. I'm fascinated by my new knowledge and in awe by how the tools are traditionally made. One of the main challenges of the book would be to find the source materials to create the tools. Imagine you have to source for big quills, bones, walnuts, bamboo and other materials. Of course if you're thinking of creating your own tools, then maybe you may have the intention to go all the way already. The chapters stand alone and can be read in any sequence. This is a very detailed and informative book. Terrific resource for those who enjoy the satisfaction of making their own drawing tools.